Whether jazz can now be officially considered a form of roots music is a question I occasionally ponder, especially when I find myself listening back to some of those old great jazz records and then contemplate the commercial demise of the genre that once represented the very apex of what was possible in American music. On the surface, jazz and country have little to nothing in common, though when you start to listen to some of the maestros in bluegrass these days, their music most certainly veers more closer to jazz than country with the degree of complexity, the structure, and the technique. Many of the formally trained bluegrass artists of today studied right beside the jazz majors in music institutions, so no wonder the two disciplines have been blending more and more. Back in the late 90’s I had a weird desire to hear the jazz trio Medeski Martin & Wood make a country-style roots record. The groove and texture the trio perfected in albums like Shack Man and Combustication was the stuff of fusion jazz legend. And then the wish was granted in a way when John Medeski formed a supergroup called The Word with steel guitar wonder Robert Randolph, and Luther and Cody Dickinson of the North Mississippi All-Stars. But as cool and talent packed as that project was, it was just a side venture for these busy artists. And then The Wood Brothers came about, consisting of Medeski Martin & Wood bass player Chris Wood, his brother and guitar player Oliver Wood from the band King Johnson, and multi-instrumentalist Jano Rix. All of a sudden this disjointed country roots fantasy I envisioned in my head but never believed would come to form was rendering in at least a close enough approximation to get excited about. Taking that musicianship, and the sense of groove and dynamics of jazz, and bringing it into the roots music space with adeptness, knowledge, and respect, The Wood Brothers have carved out their own unique discipline in the music spectrum that creates multiple avenues of appeal for a wide chunk of enlightened listeners. Whether you’re a bluegrass nerd of the traditional or progressive persuasion, a jazz aficionado looking for something a little bit offbeat and different, an Americana fan who is not afraid of a little bit of sonic exploration, or a country fan who’s a closet jazz geek or fan of funky rhythms, The Wood Brothers touch a nerve not many knew existed in the musical ganglion. Their music is heady to a point, but without impinging on the fun and infectiousness at the root of all great music. It’s in no way pretentious or too esoteric for the common ear. more Herbie Hancock than Miles Davis. 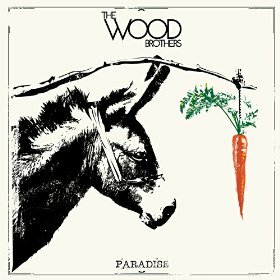 Hard to believe, but Paradise is the Wood Brothers’ ninth release including live offerings and EP’s, and they have just as much reason to be proud of this one as any of them, if not more. After releasing multiple albums on Zac Brown’s now defunct Southern Ground label, the band started out completely independent, and without a producer. Instead of searching for collaborators, they decided to produce the album themselves, and write the material together, resulting in a very cohesive work both sonically and thematically. It also is arguably their most electric album to date, with Chris Wood playing electric bass in spots, and some serious amplified six strings to help shape these songs into something fresh while still thematically remaining grounded in the spirit of the roots, especially Southern blues and soul. Paradise works like a thread, and on a few occasions you don’t even notice the old song has ended and the new one began even with an audible pause in between. Desire, self-doubt, loneliness, redemption, and fulfillment are the central themes of Paradise, explored as different chambers of the same heart on the record’s ten enriching tracks. All the compositional genius you expect from The Wood Brothers is here, but lest you think the wording in this project would be either left out or considered a second thought or figure less prominently from three men known for their musicianship first, you’d be sorely mistaken. The songwriting is where Paradise shines. The very personal and honest “Singin’ to Strangers” is one of those songs that is musicians talking shop, but they figure out how to make it less about themselves, and more about the audience. “American Heartache” offers an inverted perspective on the American dream, and the duality and eternal restlessness we all suffer from is encapsulated so exquisitely in “Never and Always” and “Two Places.” The songwriting peaks on “Without Desire,” which in many ways ties the message of Paradise together of life being about attempting to find equilibrium in a world of purposeful and ever-present imbalance, how we need our vices to discover our virtues, and how ideals can never be truly attained or life would not be worth living. It’s more about the journey than the prize. 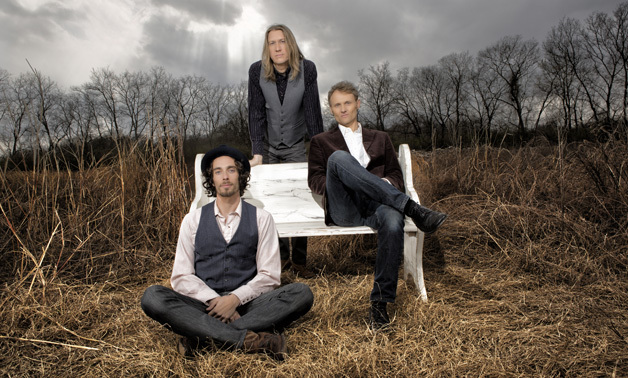 There’s something really smart going on in Paradise that listeners must not overlook, while the Wood Brothers don’t forget that it’s their job to get you moving and feeling something so that you’re open and receptive like the petals of a Lotus flower to the wisdom they look to impart. And though this is a thematic album, a song like the simple and sweet “Touch of Your Hand” can still work on its own. It’s just when it’s placed beside the other songs, it says much more than a sweet love song. Paradise should be considered a progressive roots album with electric enhancements, and not a country or bluegrass or blues album. But approached with the right mindset and an open heart, a lot of enjoyment and comprehension can be gained though this record. Meanwhile, the city of Austin smells like wet Europeans. Maybe that is prompting this foray into the weird and wonderful? I like it! A good measure of N’awluns in there too. May even be worth a purchase! Like the groove in these two songs. Maybe because at some point I listened to Norah Jones and she was a jazzy type of singer that showcased her country roots too. The Wood Brothers have a very unique sound and vibe too. Cool! Jazz and bluegrass at their best have a lot in common ”“ both take the kernels of earlier roots music and improvise around and weave together those themes. Bad jazz and bad country take those same kernels and smother the life out of them. One of my favorite singer-songwriters, who probably deserves a lot more attention from the Americana realm but doesn”™t play the promotional games or tour very widely, is Kelly Joe Phelps. He is an outstanding slide guitarist with a background in gospel, blues, folk and jazz. I am enjoying these three. I had heard a couple songs, but need to check out their albums. The album art is also excellent. I definitely like the instrumentation. But it really just reminds a lot of 90s pop or something I would’ve heard in middle school, with a rootsier sound. Very unique though, I’m definitely going to delve more into it.